Our national parks protect some of the most beautiful landscapes in the country, and provide critical habitat for our unique native plants and wildlife – many of them threatened. National parks are a central part of our work to conserve nature and biodiversity in Australia. Unfortunately right now, many state governments including Queensland are pushing to open up our national parks for cattle grazing, logging, tourist development, mining and other destructive practices for short-term political gain. The damage this will do could last generations and threatens to drive our endangered species towards extinction. Right now we have the opportunity to give these places we love the protection they deserve. Most people assume that national parks are protected and controlled by the Federal Government – but unfortunately, it isn’t the case. The Federal Government needs to act now, in this session of Parliament to protect our national parks and reserves system, by amending national environment law to include protection for national parks. Federal environment laws are essential to save our iconic areas from destruction. However State Governments and industry are demanding that federal environmental powers be handed over to State and Territory Governments. It is essential that the Federal Government retains responsibility for the protection of our most threatened places and wildlife and continues to take a leadership role on these issues, and not hand over these powers. Thanks to hundreds of people like you calling on the Federal Government we were able to put the brakes on plans to hand federal environmental protection powers to the states. Now we need to protect our parks under national environment law once and for all. Take Action today! 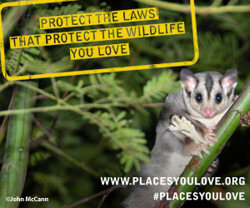 Go to the Places You Love website and send an email to Tony Burke. Ask him to ensure the Federal government protects our National Parks and the power to protect the places and wildlife we love stays firmly in the hands of the Federal Government. Thank you for all you do for our environment! For more information, visit the places you love website.